Today is John Minto’s 60th birthday. 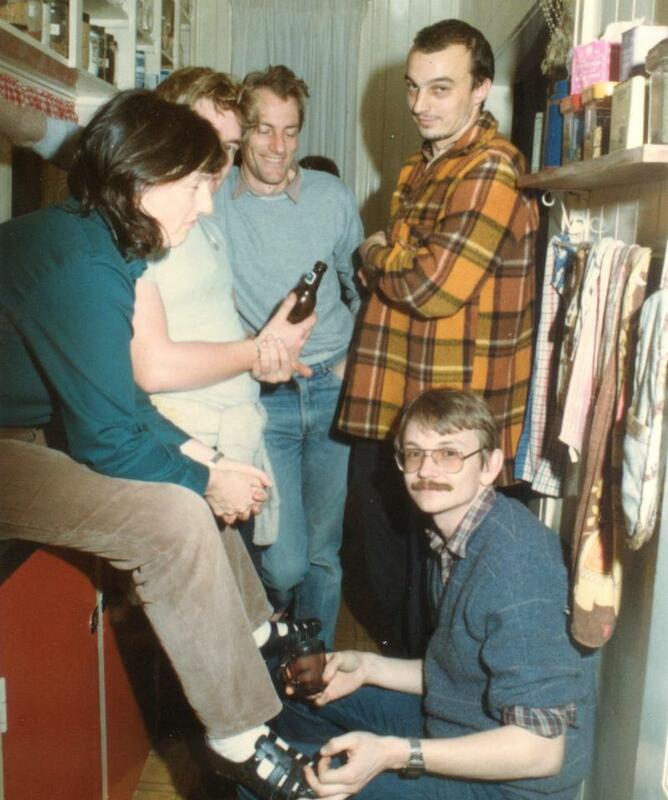 Today’s photo was taken in 1985 in a little flat in Newton on the night that the High Court issued the interim injunction preventing the New Zealand Rugby Football Union from sending a representative team to South Africa. The injunction was issued after two rugby club members protested to the court that the tour would not promote rugby in New Zealand which was the constitutional objective of the NZRFU. In 1981 I knew little of sports in South Africa, or racism in sport in general. The NZRFU inviting an apartheid team to tour New Zealand in 1981 changed that for me and a lot of other people. There are a lot of arguments that still rage today over the 1981 tour, but all that proves is that racism in sport is divisive. Towards the end of the 1981 tour I was so impacted by what I had seen that I had brought a 35mm camera and had started taking photographs and developing them in a darkroom in the bathroom. By the time the tour was over I had a job as a photographer. 1n 1984 the apartheid South African Rugby Board invited the All Blacks to tour apartheid South Africa as a representative team from New Zealand. Many people opposed this tour and I was one of them. I started going to small protests and always took my camera. By the time the No Tour 1985 movement was in full swing I was attending most of the planning meetings and I photographed the entire anti-tour campaign as best as I could. I met some incredible New Zealanders along the way, people who put others first and made huge sacrifices to pursue something they truly believed in. I respect everyone who signed a petition, attended a prayer vigil or took to the streets to be counted made sure that the 1985 Tour never went ahead. But at the head of all of this there was John Minto. I’ve been involved in enough committees and organisations to know what leadership is, and more importantly what it isn’t. I watched countless times as John Minto, as leader, made sure everyone’s opinion was heard and considered. He made sure that there was a level of protest available for everyone who wanted to participate at a level they were comfortable. And he encouraged people to go as far as they felt was right. From prayer vigils to facing baton charges from riot squads. At that time he was challenged by many of rugby’s big names, all of whom we have most likely forgotten by now. And that is as it should be. People who defended racism in sport are best forgotten. I consider John Minto to be one the great New Zealanders, and one of the greatest leaders this country will ever see. Leadership is not something we see a lot of anymore. We see a lot of greed and self interest, we see a lot of bad people doing bad things. We see too much mediocrity. We see these things every single day. Today is a good day to celebrate John Minto.